How happy are you that it's a bank holiday weekend?! I know I am! I'm just counting down the days till I go on holiday which is on the 2nd of June - not too long to wait now! Next week will probably go extremely slow for me as I'm just waiting for that day!! 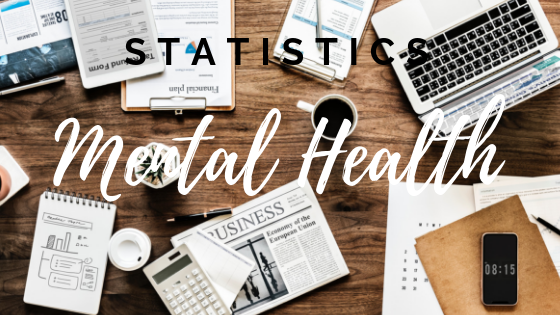 As it has been Mental Health Awareness a few weeks ago I thought I would write a post on some of the statistics, I've been doing some research into it and it's quite scary how many people have had or are experiencing mental health issues as you read this. 1 in 4 people in the UK will experience a mental health problem each year, and in England 1 in 6 people report experiencing a common mental health problem like anxiety and depression in any given week. Researching into this it is known that overall the number of people with mental health issues has not changed significantly in recent years however people the ways of how people are trying to cope with them is getting worse - more people self harm or have suicidal thoughts. In the mental health awareness week we just had the main focus for many charities was stress so there had been a study that has just been done on mental health caused by stress. From the website you can see all the statistics there, but I will mention a few. From the past year 74 percent of people have felt so stressed they have been unable to cope or felt so overwhelmed by it. However the percentage of older people to younger adults there is a major difference, 30 percent of older people reported to never feel so stressed they couldn't cope to only 7 percent of younger people who had reported to never feel this way. A high statistic for younger people is from the pressure to succeed - 60 percent of 18-24 year olds and 41 percent of 25-34 year olds reported this, compared to 17 percent of 45-54 year olds and only 6 percent for those over 55. If you want to see the exact statistics for these you can click onto the link above. I thought I'd discuss a few statistics of mental health problems with young people as I am under that category. 10 percent of school children have a diagnosable mental illness - in average if you had a class of 30 children, three will have a mental health problem. It is said that 75 percent of young people with a mental health problem are not receiving treatment for it. Suicide is the biggest killer of young people in the UK - it is the leading cause of death in young men and women aged 20-34. It is also revealed that the number of young suicides each year is greater than it has been for the past 10 years. More than half of young people feel embarrassed about mental illness - it is reported that females are more likely to say they have a mental health problem than males. These are just a few statistics I have got from surveys - it just goes to show how big the problem is. I don't want to bombard you with too many numbers but I just wanted to outline how many people suffer with mental health problems, these statistics as well will not be including everyone - there's so many people out there that suffer with these issues but won't have gone to a professional to be diagnosed or sought help or treatment. I hope you all have a lovely bank holiday weekend whatever you are doing. As always, chat soon!